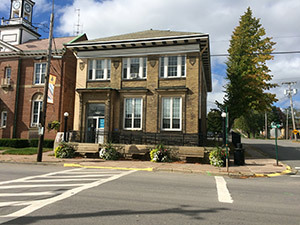 Information The Stellarton Library is located in the historic Bank of Nova Scotia building on Foord Street, and is next door to the Town Office, and the Town Square Park (with a Splashpad). A BikeFixIt station is located at the library, in the small green space next to the Town Hall, and an outdoor Community Bulletin Board is located at the library entrance. The Stellarton Library is also a wireless hotspot (WIFI) with high speed Internet access. Reader's advisory, reference, inter-library loan, Public Internet access, public computer workstations, FAX machine, scanner, photocopier, printer, digital cameras, color photoprinter, GPS, family play packs, and Nordic walking poles. Located outside is a BikeFix-It station, and a Community Notice Board. Instructional tours available upon request. A special monthly delivery service to several residential care homes is available for Seniors, please call or e-mail for details.